First a word from our sponsors: the Star Circle Academy has scheduled a reprise of the Alabama Hills Star Circle Workshop in November, 2011. Signup is available now. The annual Geminid Meteor shower peaks December 13/14th (that’s after midnight on the 13th). The weather forecast for the San Francisco Bay area was not promising for 2010. 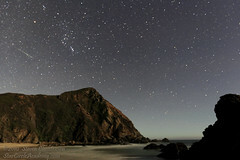 Fortunately less than two hours to the south in Big Sur the forecast was for clear skies. And the skies were clear! Image 1: A slightly out of focus image reveals a meteor from the Gemini radiate point. The radiant point is above and to the left of this image. Figure 1: Sweet. Clear, no clouds, no rain, and humidity not too high. But this area is a bit inland and we’ll be at the coast. 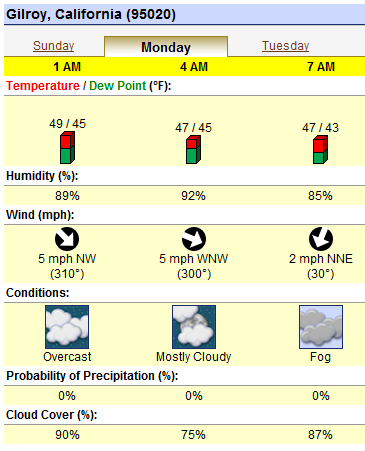 Notice the 0% cloud cover and the 0% chance of precipitation from 1 AM until 7 AM. Another important factor is the dew point. 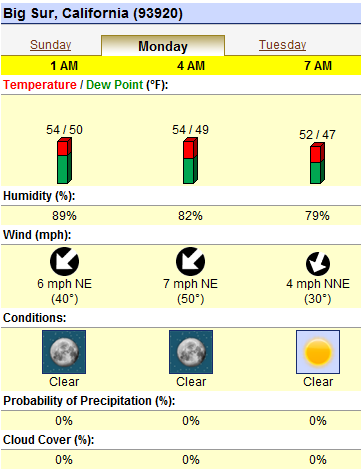 With an air temperature of 54 degrees and a dew point of 50 degrees (humidity of 89%) there is a pretty good chance of avoiding both fog and dew. But remember that these are forecasts. Like all forecasts they may be wrong. I dropped you this note to let you know I just finished shoveling 3 feet of “partly cloudy” from my driveway. The forecast wind direction is also favorable. A light off shore wind from the north is perfect for the location I had in mind. For comparison, Figure 2 shows the forecast for a location much nearer to home. Figure 2: Lots of clouds. Figure 3: Peak forecast. Rain, Humidity, Clouds… oh my! 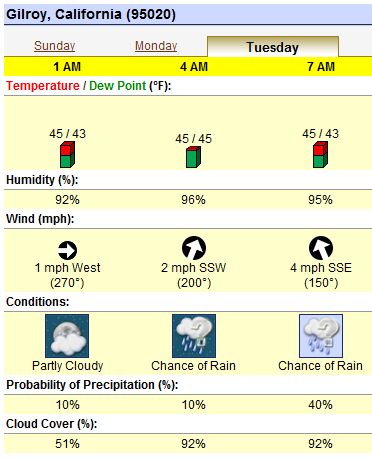 Notice that the prediction is 51% or more cloud cover, and very high humidity. High humidity and low winds means fog and lots of dew on the lens. An ideal star shoot has few or no clouds, low humidity low wind and no precipitation. An even better hour by hour forecast can be found with the tool “Clear Sky Chart” (aka Clear Sky Clock) which I described in the article Mostly Free Tools. But Clear Sky Chart does not cover every location, and provides at most 36 hours advance forecast. It is, however very accurate and very applicable for night sky observing. Dew is definitely a problem. Dew is moisture that condenses and falls onto or forms on a surface. Think cold drink with a damp wet smog forming on it. An empty glass, or a glass of room temperature water will not collect condensation – but one below room temperature does. I got the double whammy at Big Sur. Just near midnight condensation was forming on my lenses. Periodically wiping the lens with a cloth certainly helps but the camera better be rock solid and it is best to use a dark rag so as not to ruin an exposure in progress. The rag also should be clean (no sand/grit) so as not to scratch the lens and lint free so it does not leave detritus and it must be dry so it does not leave smudges. That is a lot to ask of one little cloth – better have two or more. Creative alternatives to the dew rag include using a blow dryer periodically. If a nearby power outlet is available you are in business. There are 12 volt dryers that can be powered from a car battery – but these are not completely practical solutions; who wants to be tethered to a car or a building? Another strategy is to employ an anti-dew heater. Sometimes these are called “Dew Heaters” but in fact they are not designed to ‘heat the dew’ but to keep the lens just a skoch warmer than the atmosphere so that condensation does not form in the first place. Powered dew deterrents can be purchased – usually from astronomy shops and sites. Building your own heater is not terribly difficult if you know which end of a soldering iron to hold. Doing a good job of making a heater is not trivial. Another alternative is to use the chemical hand warmers that are air-activated. One caution is that these packets contain charcoal and iron filings – definitely not things you want to get into or on your lens. On the up side, however the chemical warmer packs are light weight and pretty effective – and they will help with cold hands and feet, too. You can find hand warmers at many department stores and sporting goods stores, or online. Another deterrent is a nice big lens hood. Something I ALSO forgot to bring for my workhorse lens. But it may not have helped all that much because I was pointing my lens up at a sharp angle – about 45 degrees to try to catch as much in the sky as possible. At that angle the lens is completely pointed at the sky and it quickly loses heat. Don’t believe me? Try this experiment: park your car overnight where one side is near a tall wooden fence or thick hedges and the other side is exposed to open air. In the morning a lot more frost and dew will appear on the exposed side of the car. On the night of my expedition to Big Sur I neglected to bring any dew deterrent – not the hand warmers and not the heater, not the lens hood. Collecting star trails or attempting to capture meteors while also having to frequently wipe a lens is both aggravating and tedious and a bit scary since at one point I dropped the rag in the sand. Knowing that the dew was forming on my lens because the lens was colder than the air I took the camera off the tripod and grasped the barrel of the lens in my nice warm hands – under a blanket – for about 10 minutes. This quite successfully eliminated the dew from the outermost lens (the objective) but because the lens had been in a moist environment for quite a while my action created a worse problem… condensation on one of the inner elements. A warm, dry environment, especially one with a desiccant like silica gel is the only solution for condensation inside the lens… and you do not want it TOO warm because it might encourage fungus to grow. The key is dry. With my batteries spent and my fight against the dew a losing one I licked my wounds and called it quits. 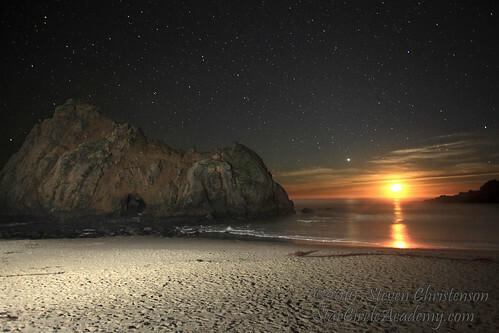 Fortunately the night was not a complete loss as I did collect one meteor (above), I saw about two dozen others and I came away with some appealing shots of the beach, rocks, surf and stars – as well as a smug grin knowing that the horribly overcast conditions two hours north of me was confounding my friends who stayed in the Bay Area. 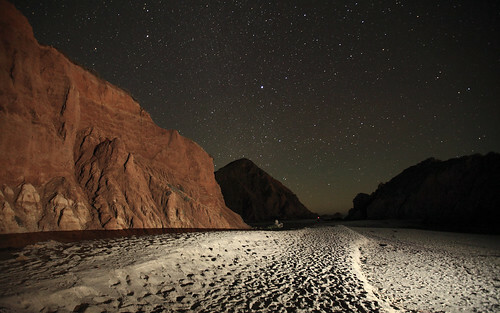 Image 2: Rock & Stars witness the setting Moon and Jupiter – flash filled. Image 3: Eroded Cliff and Textured Sand – flash filled. By the way, you might be interested in my “Dew Defeated” article which discusses the Dew-Not system. This entry was posted in Image, Photo Tip and tagged Clear Sky Chart, condensation, desicant, dew, dew heaters, forecast, fungus, hand warmers, humidity, ideal weather on December 14, 2010 by Steven Christenson.